This recipe makes milk delicious and more nutritious. It takes a max. of 10 minutes to prepare the drink. Ragi adds nutrition and texture. The saffron gives colour and flavour. Almonds add nutrition and richness to this dish. Ragi It make kids bone stronger, acts as a tonic for lack of milk production in lactating women. Ragi is a rich source of calcium and fiber and it helps to lower cholesterol level. Ragi is one of the best health foods for reducing weight, controlling diabetes and cooling the body. Ragi can be used as a substitute for people allergic to milk. The active components in saffron have many therapeutic applications in many traditional medicines as antiseptic, antidepressant, anti-oxidant and digestive. In a milk pan add milk, sugar, ragi powder and dissolve well with a ladle without forming any lumps. Switch on the gas and allow the ragi mixed milk to boil. When it starts to boil stir continuously with a ladle. Reduce the flame to medium and cook ragi milk (till the raw taste of ragi goes completely) around two to three minutes constantly stirring. 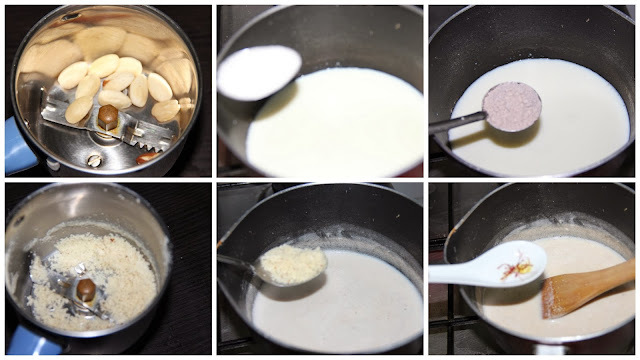 Take almonds in a blender to make a fine power and add this in to the boiling ragi milk. Add saffron strands as well. Allow to cook for two minutes and put off the gas. Note: During the whole process constant stirring is essential to avoid forming lumps. Ragi should not be added to boiling milk, since hot milk may cause lumps to be formed. Don’t allow to cook for long time. This affects the taste and consistency.